Update: Another validation has been found thanks to the Overclock.net community which shows the Core i5-4670K overclocked to 6.2 GHz at 1.216V. Could be a bug but if not then really impressive stuff for Haswell. 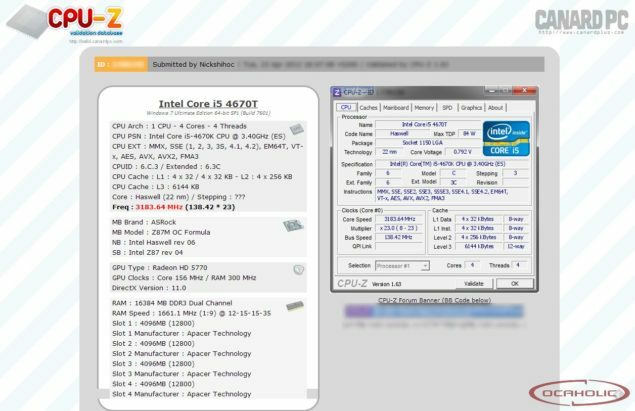 The folks at OCaholic have spotted a large list of CPU-z validations which show that the upcoming Core i7-4770K was overclocked to 7 GHz at 2.56V. 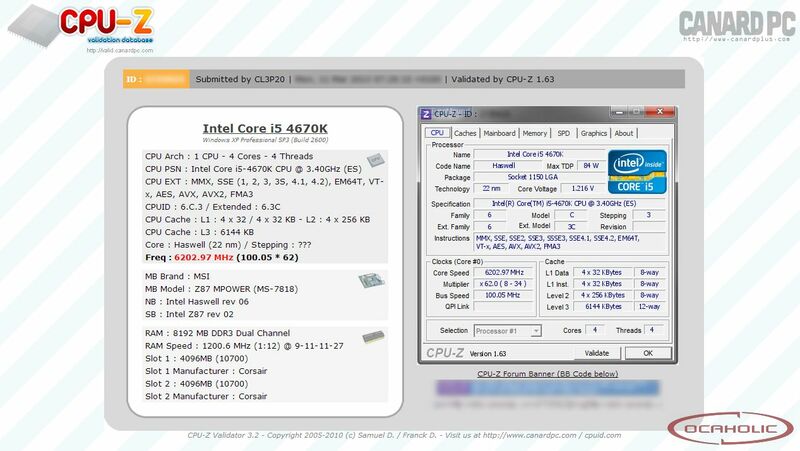 Intel’s fourth generation Haswell line of processors are expected to launch on June 3rd 2013, several benchmarks of the processor have been leaked which can be seen here and here. 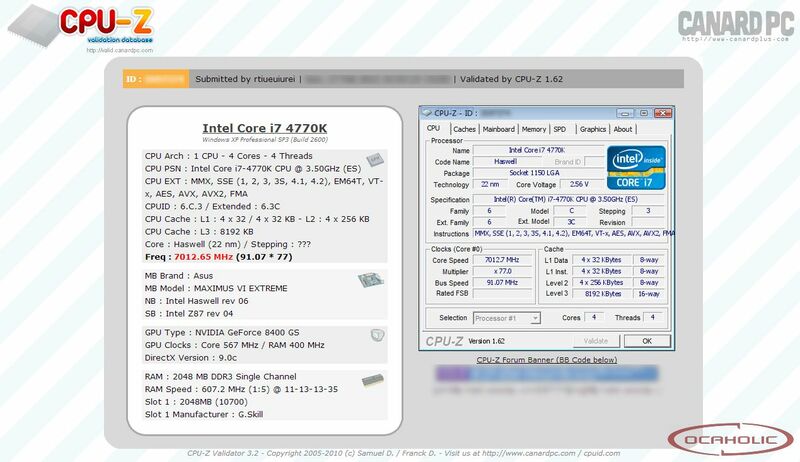 Although benchmarks have been leaking for quiet some time but we never got to see an overclocked validation of the Haswell CPU. Even in its enginerring phase, the Core i7-4770K broke the 7 GHz barrier recording a record OC for Haswell at 7012.65 MHz (91.07 * 77). It is highly possible that the retail version with better stability could achieve an 8 GHz overclock. The record was achieved on the upcoming ASUS Maximus VI Extreme Edition motherboard which we haven’t seen yet but probably would before Haswell launches at Computex 2013. The validation spree didn’t end here as moments later, another CPU-z shot was spotted but this time on a different CPU running on entirely different boards. This time the CPU used was also an 22nm Haswell chip but instead of the Core i7-4770K, the user used the Core i5-4670T on the ASRock’s upcoming Z87M-OC Formula and the MSI Z87 MPOWER MAX motherboard which was teased last week The MPower board was using an Core i5-4670K processor. The most important thing to note is that the APACER memory on the Core i5-4670T rig was overclocked to an impressive 1661 MHz, which means an effective clock speed of 3322 Mhz. This is quiet impressive since these speeds are similar to what we would be looking at when DDR4 becomes standard in 2015.